Normal range blood sugar levels begin at 72 mg/dl which is normal and range to 85 mg/dl to be within the healthy, non-diabetic parameters. Does this seem low compared with what you are hearing elsewhere? The current criteria, for some in the medical/diabetes community, is that you are not diabetic unless your fasting blood glucose exceeds 125 mg/dL. The range between 100 and 125 mg/dL is considered prediabetic. However, there are many doctors and health practitioners who agree that this is far too high. In other words, no one should be comfortable when their blood sugar is above 85 mg/dL. Keep in mind that under 70 mg/dL would be considered low blood sugar and indicate hypoglycemia. Normal range blood sugar levels are ideally no higher than 85 mg/dL. It is true that it is challenging to reduce one’s blood sugar after it’s been high for too long but it doesn’t mean you shouldn’t aim to get as close to 85 mg/dL and below as possible. Regular exercise and eating low glycemic foods that metabolize slowly will help you to get into normal range blood sugar levels. Health care practitioners will tell you to get a fasting blood sugar test when your blood sugar is at it's lowest level. This just means to get the test or test yourself first thing in the morning before eating breakfast. The fasting blood test is going to give you an accurate reading for your baseline (or normal) blood sugar levels. If you are sick or stressed or agitated it could affect the test so choose the most optimum day for testing. To eliminate blood sugar spikes you need to pay close attention to eating low glycemic foods, the ones that don't raise your blood sugar. Regular, aerobic exercise is necessary as well in order for you to permanently lower and stabilize your blood sugar. If you are eating sugar laden, processed white foods, you are most likely to experience the spikes in your blood sugar. Always seek the advice and care of your doctor or other health care physician before making dietary changes and lifestyle changes. If you suspect you may have type 2 diabetes be sure to see your doctor for a thorough evaluation. A doctor can best supervise your blood sugar. A blood sugar device may be helpful to monitor yourself at home but ask your physician's advice. Incidence of disease begins to increase when fasting blood sugar rises above 85 mg/dL. This means that there could be cellular damage and it is harder to lose weight. It doesn't mean that it cannot be repaired but you need to pay close attention to reducing your blood sugar levels! You can purchase this home use blood sugar meter below by clicking the Amazon link. Ask your doctor if it's a good idea to be able to test your blood sugar at home. You can buy the one above here online. It comes with some blood sugar strips to get you started. However, any good corner drugstore is likely to have a blood sugar meter and blood sugar strips. By investing in this system, with your doctor's approval, you can see immediately what your blood sugar is and whether you are within the normal range blood sugar levels. It could be helpful to have one at home to closely monitor how your dietary changes are working. Just follow the directions on the box. It just takes a simple finger prick. If you are having difficulty with the motivation to take this lifetime fat loss low glycemic plan seriously and sticking with it, it is illuminating to understand what your blood sugar really is. I work with many people who are middle aged who have great difficulty getting the fat off and it is because their blood sugar has been too high for too long. 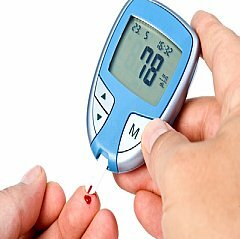 Most people do not know if they are within the normal range blood sugar levels. If you are not, it doesn’t mean you cannot reverse your high blood sugar but you have to be committed to low glycemic eating and exercise. Nothing is more motivating than realizing that not only must you lose fat, but your health is in jeopardy. There are many disease risks for high normal blood sugar which would be the range above 85 mg/dL, including cancer, cardiovascular disease, cognitive impairment, kidney disease, pancreatic dysfunction, diabetic retinopathy, and neuropathy. It cannot be emphasized enough that once you know if your normal range blood sugar levels are consistently above 85 mg/dL you need to take serious action. Get the advice of a medical professional. Go to the foods that lower blood sugar page and begin reading about low glycemic eating. Your blood sugar can be lowered and stabilized by paying careful attention to what you eat and getting regular, aerobic exercise. * Glucose tolerance and mortality: comparison of WHO and American Diabetes Association diagnostic criteria. The DECODE study group. European Diabetes Epidemiology Group. Diabetes Epidemiology: Collaborative analysis of Diagnostic criteria in Europe. Lancet, 1999 Aug. 21;354(9179):617-21. * Nakagami T. Hyperglycaemia and mortality from all causes and from cardiovascular disease in five populations of Asian origin. Diabetologia. 2004 Mar;47(3):385-94. * Lin HJ, Lee BC, Ho Yl, et. al. Postprandial glucose improves the risk prediction of cardovascular death beyond the metabolic syndrome in the nondiabetic population. Diabetes Care. 2009 Sep;329):1721-6. * Hemminki K, Li X, Sundquist J, Sundquist K. Risk of cancer following hospitalization for type 2 diabetes. The Oncologist, 2010;15(6):548-55. Epub 2010 May 17. * Tali Cukierman-Yaffe T, Gerstein HC, Williamson JD,. Relationship between baseline glycemic control and cognitive function in individuals with type 2 diabetes and other cardiovascular risk factors: the action to control cardiovascular risk in diabetes-memory in diabetes (ADDORD-MIND) trial. Diabetes Care, 2009 Feb;32(2):221-6. * Sumner CJ, Sheth S, Griffin JW, Cornblath DR, Polydefkis M. The spectrum of neuropathy in diabetes and impaired glucose tolerance. Neurology, 2003 Jan 14;60(1):108-11. * Hoffman-Snyder C;Smith BE;Ross MA;Hernandez J;Bosch EP, Value of the oral glucose tolerance test in the evaluation of chronic idiopathic axonal polyneuropathy, Arch Neurol. 2006 Aug;63(8);1075-9. These are the foods that can keep your blood sugar in the normal range. Yes, cinnamon can greatly assist you in managing your weight by supporting low blood sugar and the regulation of fat metabolism! Do you think you have metabolic syndrome? It means that high blood sugar and high insulin have created a disturbance to your metabolic balance. Return from Normal Range Blood Sugar Levels to Stopping Type 2 Diabetes. Return from Normal Range Blood Sugar Levels to Lifetime Fat Loss home page.